Are you experiencing problems with the asphalt at your apartment complex? As long as your parking lot is properly maintained with clear, concise signage and directional painting, it makes entering and parking a whole lot less easier! Make sure you inspect your parking lot on a regular basis. If you recognize any cracks, they should be sealed as quickly as possible; there’s no reason to wait until the damage is done and expensive patching is needed. Asphalt Crack Sealing will prevent water from entering and weakening the base. This way, the cracks won’t spread or get any wider, especially during the winter. Using Infrared Asphalt Technology, we can repair any of the potholes on your parking lot. This unique method blends existing asphalt, which is heated up to 325 degrees, with added hot mix. The combination is then raked and compacted to create a seamless restoration. As the best alternative to the traditional saw cut, remove & replace method, this technology will help you save both time and money. In addition, it can also be used to repair any areas holding water (bird baths), which are considered early signs of where potholes might eventually form. Protect your asphalt from deterioration and, in turn, extend the life cycle of your pavement significantly with Asphalt Sealcoating; which can be sealed 8-12 months after being laid for the best results. This will protect your asphalt from the sun’s ultraviolet rays, as well resist gas and oil stains. Moreover, the smooth surface allows for easier year-round maintenance. This will provide you with a smooth, jet black finish and a fresh new appearance for your parking lot. Rejuvenating Asphalt is a practical alternative to Sealcoating. Ideally, it’s applied on a non-sealed surface, where the penetrating material can restore lost oils and repair damage within the asphalt matrix. This process delays the need for repaving and can improve the appearance of pavement during any stage of its life cycle. The ultimate goal is to keep the pavement in great working condition. As long as it’s applied properly, the CPR asphalt rejuvenator can more than double the lifespan of your parking lot. If the striping and pavement markings on your parking lot are faded or confusing, make sure you brighten them up by requesting our Parking Lot Striping This will keep your parking lot looking fresh, while also helping your tenants navigate safely. 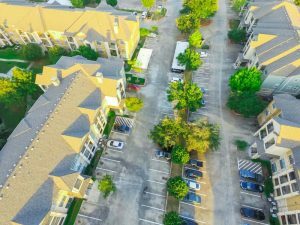 From the design and layout to initial pavement marking and final application, our road and parking lot striping services will immediately portray a positive image of your apartment complex. Clear and concise Traffic Signage will help eliminate the risk of accidents for both vehicles and pedestrians. We carry signs such as “Buses Only,” “Do Not Enter,” and “No Trucks Allowed,” which feature highly-visible material and fonts. This way, motorists can clearly see the signs even in crowded or low-lit areas. We can create any sign required for your parking lot. All our products are engineer grade reflective street signs that can be installed on a green u channel, galvanized or round post. Whether you you need us to perform pothole repairs at a large parking lot in Philadelphia, for example, or you want to sealcoat a small parking lot in New Jersey, you can trust our experienced crew for all your apartment complex needs. 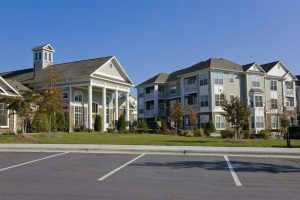 Gain peace of mind about the curb appeal and safety of your apartment complex by contacting the pros here at Asphalt Pavement Solutions. For a free estimate, fill out a contact form on our website or call 1-856-288-1656 to speak with a member of our staff today!